The Highest Bioavailable Curcumin Supplement Available Using a Patent Pending Protein Bonding Technology That Delivers Clinical Levels of Curcumin To The Bloodstream In 20-40 Minutes. 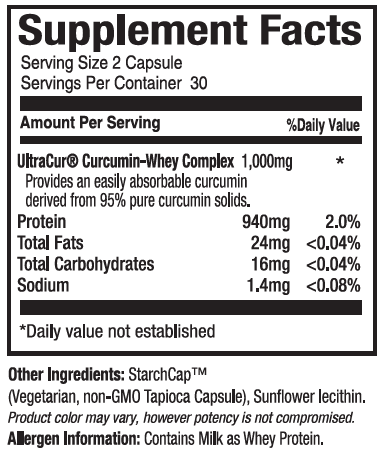 The key issue with curcumin is that it can't be absorbed readily. UltraCur's (branded ingredient) bioceutical curcumin formulation is nearly fully absorbed. At this level of bioavailability, curcumin serum levels reach 200-2,000 ng/ml, a level that allows the full clinical potential of curcumin to be realized for the first time. To put that in perspective, one capsule of UltraCur has the potency of 120 grams, or ¼ lb. of curcumin. That's a bioavailability increase of 15,000 fold relative to standard curcumin and 1000 fold relative to curcumin piperine combination products. 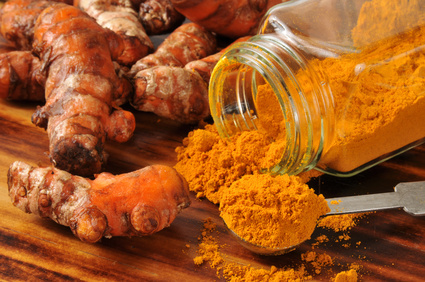 Curcumin is nature's most potent antioxidant and anti-inflammatory compound. It enhances cellular resistance to oxidative damage and protection against DNA damage, 2 of the key factors involved in aging and stress-related toxicity*. It also increases glutathione S-transferase and cytochrome P450 activity in the liver, which further aids in response to environmental and metabolic stressors. Thousands of studies have been published demonstrating curcumin's nerve, liver, joint, GI, and cardiovascular protective properties*. For example, in multiple clinical studies curcumin has demonstrated improved joint function and activity in osteoarthritis and rheumatoid arthritis patients*. Curcumin is a polyphenolic compound derived from the plant Curcuma Longa, commonly known as turmeric. Curcumin has been used for centuries as both a food preservative and to treat a wide variety of ailments in Ayurvedic medicine. Modern in vitro and in vivo studies have confirmed curcumin to be a multitherapeutic agent with a range of beneficial biological consequences including; anti-carcinogenic, anti-oxidative and anti-inflammatory effects. Unfortunately, free curcumin has extremely low bioavailability in the body due to low intrinsic activity, poor absorption, rapid metabolism and rapid elimination from the body (1). This low bioavailability necessitates the use of extremely high doses (15 grams or more, per person) in order to obtain effective health benefits, or observe peripheral blood levels of curcumin. Ultra Botanica has developed a patent-pending method for curcumin formulation that is significantly more bioavailable. This curcumin product; UltraCür, has the potential to provide significant improvement in curcumin bioavailability and subsequent advancement as a clinical product. 1. ClinicalTrials.gov: Current clinical trials on curcumin". US National Institutes of Health, Clinical Trial Registry. June 2015. 2. Anand, P.; Kunnumakkara, A. B.; Newman, R. A.; Aggarwal, B. B. (2007). "Bioavailability of curcumin: problems and promises". Molecular Pharmaceutics 4 (6): 807–818. doi:10.1021/mp700113r. PMID 17999464.